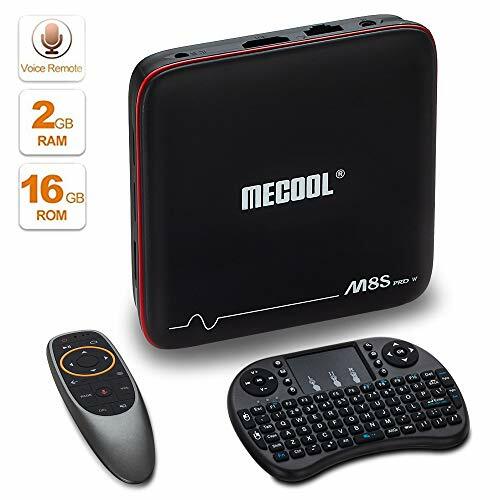 [OTA Online Upgrade]：No need to empty user date, system cache, or get a firmware, MECOOOL TV BOX will remind you system upgrading in time and faster. 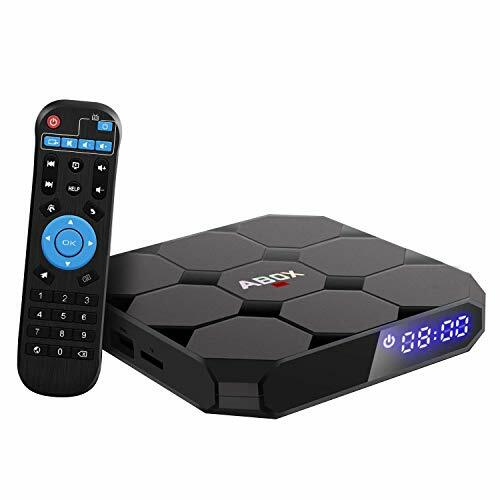 [Powerful Amlogic S905W Quad Core CPU] Sidiwen M8S PRO W TV box is based on the Android 7.1.2 OS with powerful Amlogic S905W quad core ARM Cortex-A53 CPU, which is way ahead in image processing and computing. Its high machine configuration gives you ultra-fast running speed and professional image processing ability. [High Reaction Speed] The smart TV box has DDR3 2GB RAM/EMMC 16GB ROM and a TF card slot. 2GB RAM ensures you can better run apps, play games and watch movies more smoothly without any buffering and freezing.16GB storage capacity make you have more space to download whatever you like from network and caches to browse websites, play games. You can also expand the memory via TF card slot, never worry about running out of space. [Support 3D Video 4K Output Resolution and H.265] This mini TV box supports 3D video and 4K output resolution. Giving you a private 3D home theater, you can feel the shock of 3D cinema-like stereoscopic vision at home.H.265 decoding can save 50% bandwidth resources, let you watch the 4K movie smoothly. High definition gives you the opportunity to observe some details which eyes can not see, gives you immersive picture quality that's optimized for your TV with crisp details and rich color. [Fluent 2.4GHz WIFI and 100M Ethernet LAN] Built in 2.4G WIFI, support IEEE 802.11 b/g/n, providing a reasonable distribution of WIFI flow. Never to worry about slow downloaded speed, and much more connection options when you watch videos and play games, etc. Just plug in the power supply, connect the box HDMI cable and WIFI/Ethernet, you can watch whatever you like. 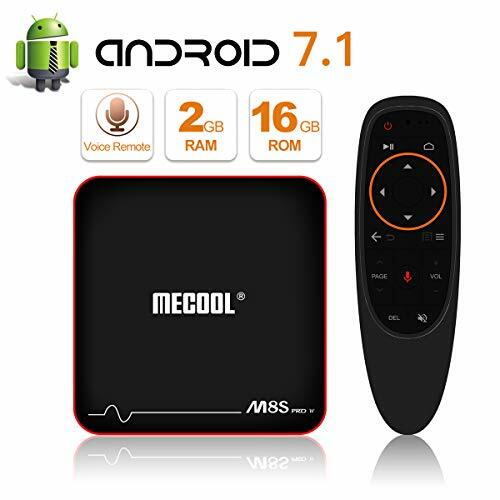 [Android 7.1 OS] It runs on Android TV 7.1 System which is easy to setup, supports media player,your favorite TV shows,watch news or switch to radio,play games and so on. [Memory & Expandable Storage] It boasts 2GB RAM and 16GB ROM, supporting TF Card Reading up to 32GB, giving you more space to download your favorite media files and to browse websites, play games, watch movies more smoothly. [Advanced Configuration] Powered by Amlogic S905W Quad-core ARM Cortex-A53 CPU, it is an HD media player with Mali-450MP Penta-core,up to 750MHz GPU. [Your Own Home Theater] Once connected it with your WiFi or RJ45, your HDTV becomes into a smart streaming machine. You can watch movies and TV shows and play games on the Internet, making home entertainment easier. Warrranty: Our Android TV BOXes have 12-Month Warranty. Any questions, please feel free contact us directly. All-New Design: Jet Black color design, beautiful sapphire blue logo light when power-on, less than an inch tall and under 1.2 pound, keeps a low profile without sacrificing functionality. Innovative Voice Remote: Range up to 50 feet, 3x further than traditional IR remote. Easily find, launch and control contents by simply saying to it, save time searching, spend time watching. Android TV UI: ABOX A4 features a full onscreen interface, search capabilities and blades of scrollable titles. User interface looks much more straightforward than what was available on other tv box. Best App Compatibility: Sign in Google account, get access to all apps from play store, its super compatibility allows you to play with various apps. OTA Upgrade: No need to empty user date, system cache, or get a firmware, ABOX A4 will remind you system upgrading in time and faster. 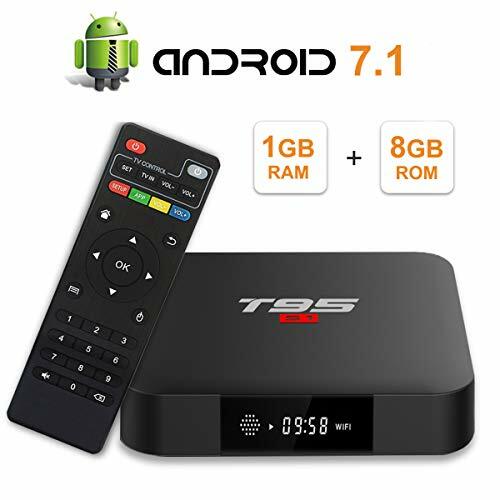 【Android 7.1.2 OS】T95S2 tv box adopts the powerful and mature android 7.1.2 operating system,integrated the latest media player software,compatible with many android APP,free Internet searching,many kinds of games,etc for home entertainment to meet the needs of different users. 【Latest powerful chip】The Smart TV Box comes with the newest S905W Amlogic Quad core Cortex-A53 CPU up to 2 GHz Ultra high frequency, provides you ultra-fast running speed and professional graphic processing ability. 【Large Storage】This android mini PC box is built with high speed 2GB RAM with 16GB ROM, with our newest efficiently optimized android system, it provide a extremely high frequency and responsive performance. You can also add an extra TF card to expand storage up to 64GB.Say goodbye to buffering, lagging and freezing, it bring a excellent experience beyond your expectation. 【3D ,4K smart tv box】You don't need to go to the cinema to watch 3D movie, the 4K resolution is 4 times more than full HD. Professional H.265 video decoding technology can saves 50% of bandwidth resources. 【ZSRbox Professional Service Team】ZSRbox has a professional technical team to solve your problems anytime, anywhere. Bring you 100% satisfied shopping experience. [Android 7.1 OS]Smart tv box comes with the android 7.1.2 system,which raises the bar in performance and usability with a slick lag-free interface.Users can download all the tools and games and apps at the play store easily and conveniently. 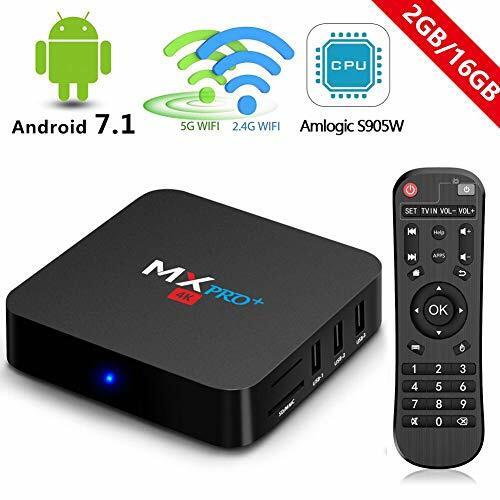 [High Profession & Smarter]Android 7.1 TV Box comes with S905W Quad-core CPU that can reach a speed of up to 2.0GHz,provides you with ultra-fast running speed and professional graphic processing ability,which makes home entertainment become easy. [1GB RAM + 8GB ROM ] 1GB DDR 8GB flash storage, 32GB (card not Included) Maximum extended capacity gives you more space to download your favorite apps and caches to browse websites, play games, run Apps. [4K Resolution,H.265 Decoding]The Smart mini android box gives an extreme experience with 4K resolution when you watch movies or play games ,you don't miss any details.H.265 hardware decoding can save 50% bandwidth resources, let you watch the 4K movie smoothly. [Plug and Play]:Easy to install. 1. Connect HD cable and power cable with your TV. 2.Connect Ethernet / WiFi. 3.Tune to the appropriate channel. Then you can turn on your android tv box and TV to enjoy the splendid viewing world. [Android 7.1 Nougat OS] TX3 mini runs on the latest Android 7.1 Nougat System which is perfect in productivity, stability and performance, along with various of features and optimizations, delivering an improved user experience. 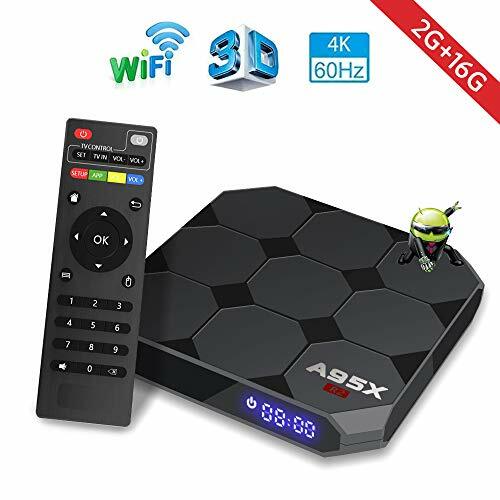 [Amlogic S905W CPU] Powered by Amlogic S905W Quad core ARM Cortex-A53 CPU up to 2.0 GHz ultra high frequency, TX3 mini is a HD media player with Mali-450 penta-core, up to 750MHz+(DVFS) GPU. [Memory & Expandable Storage] It boasts 2GB RAM and 16GB ROM, supporting TF Card Reading up to 32GB, giving you more space to download your favorite media files or apps and to browse websites, play games, watch movies more smoothly. [HEVC H.265 & UHD 4K] H.265 decoding can save about 50% band-width compared to H.264; UHD 4K * 2K output provides you high definition viewing and fluent video playing, making it as the highest resolution signal available for home movies. 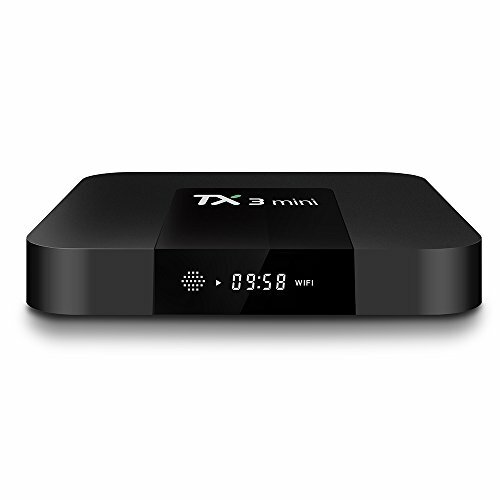 [Your Own Home Theater] Once connected TX3 mini with your WiFi or RJ45, your HDTV becomes into a smart streaming machine. You will watch movies and TV shows and play games from the Internet, making home entertainment easier. 【Android 7.1.2 Nougat OS】 The android 7.1 TV box adopts the fast and powerful Android 7.1 operation system,which makes sure the TV box is way ahead in professional image processing and ultra-fast running speed. 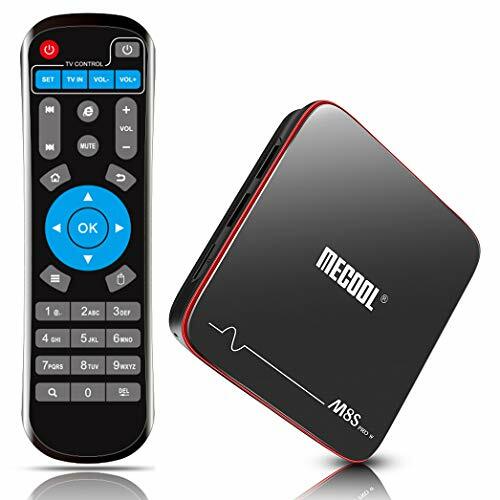 【High Reaction Speed】 The android TV box is equipped with the newest chip-set loaded with the high speed Quad Core CPU,up to 2 GHz ultra high frequency,more than 4 times performance improvements. Support 2.4GHz WiFi and 100M. 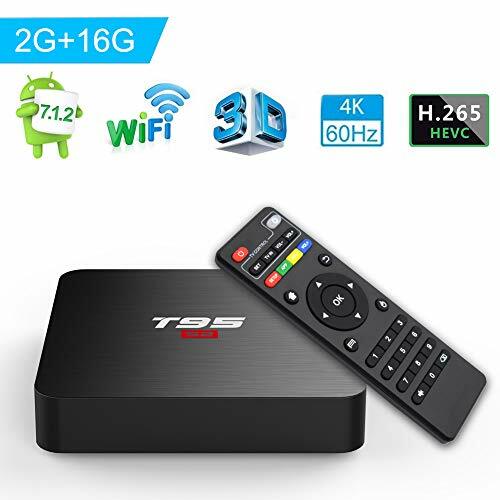 【4K & H.265 HD Decoding】 TUREWELL T95 S2 TV box support 4K and H.265 HD decoding,offers 4k * 2k output with 100Mbps cable network which provides you higher definition viewing and fluent video playing. 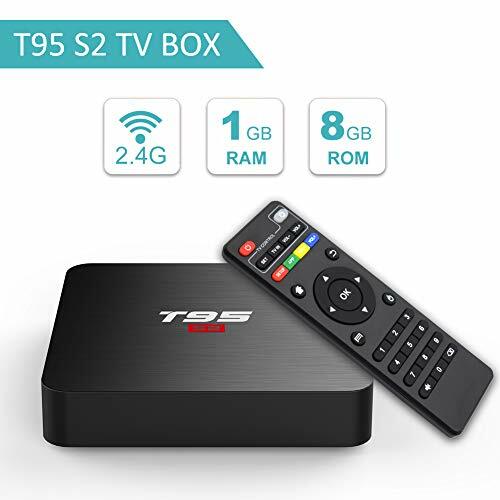 【2GB RAM + 16GB ROM】 The capacity of T95 S2 TV Box provides more space and caches to install apps and ensures the stability of the system, also supports faster and more stable operation. 【Easy & Convenient to Use】 It is very easy to install, as soon as you plug in the power supply and connect the TV box to your Wi-Fi, you watch whatever you like. 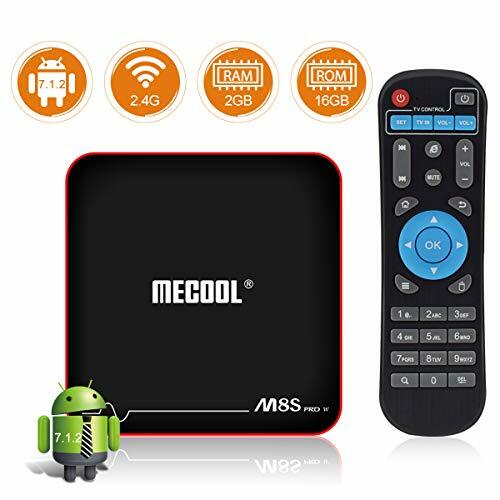 2G RAM(DDR3) + 16GB(EMMC): This android tv box with 2G RAM + 16G ROM capacity provides more space and caches to install apps and ensures the stability of the system, also supports faster and more stable operation. Rapid & Stable Android 7.1 System: With OS updated to the latest Android 7.1.2 version, it is coupled with the rapid and stable configuration. Just to enjoy all your favorite movies, food shows and entertainment programs. 4K Resolution and H.265 VP9 Decoding: supports H.265 decoding and HDR image quality improved technology, support 4K playing, enable the scenes and characters to come to life in vivid contrast, color, and clarity. Practical Multi-media Player: supports bluetooth, Ethernet Lan, DLNA, Airplay, Google TV Remote, 3D moive,HDMI2.0, etc. Never to worry about slow downloaded speed, and much more connection options when you watch videos and play games, etc. 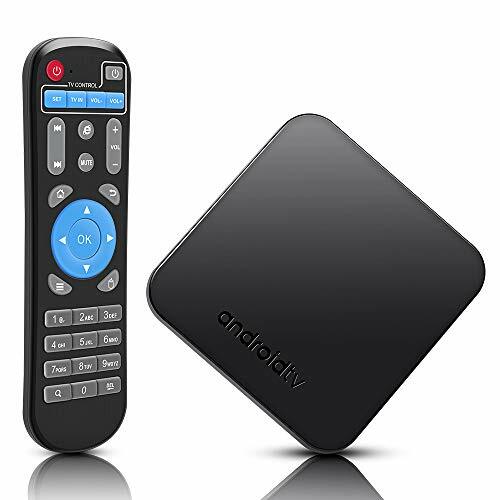 Plug and Play: Install in less than 1 minute, all you need is to connect HD cord with your TV, then the Ethernet / WiFi, then you can turn on your Smart Android TV Box and TV to enjoy the splendid viewing world. Newest Model T95 S1 Android TV Box has Amlogic S905W Quad core Cortex-A53 CPU, Mali-450 5-Core GPU. This configuration gives you ultra-fast running speed and professional image processing ability. With OS updated to the latest Android 7.1.2 version, compatibility with the vast majority of latest android applications and more user friendly, it can meet the needs of different users. H.265 video decoding, you can download resources by taking half time and half occupation of bandwidth of H.264 decoding, it is faster and more stable. Based on H.265 HD decoding, it offers 4k * 2k output, make the scenes and characters more vivid. 1GB RAM &8GB ROM capacity provides more space and caches to install apps and ensures the stability of the system, also supports faster and more stable operation. 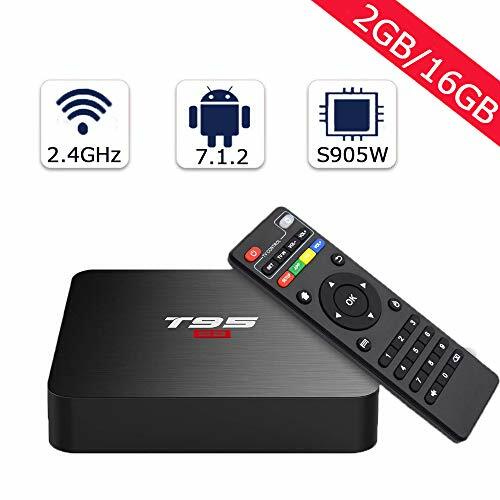 T95 S1 android box is very to use, install in less than 1 minute, all you need is to connect HDMI cable with your TV and connect the power supply, then the Ethernet/ WiFi, then you can turn on your Smart Android TV Box and TV to enjoy the splendid viewing world. High Profession and Smart: T95 S1 smart tv box uses professional Amlogic S905W Quad Core Cortex-A53, 2G RAM+16G ROM, comes with Android 7.1 operation system and wifi which make sure the android tv box running stable and smooth to load movies, pictures and games without buffer, no need to wait for wonderful moment. 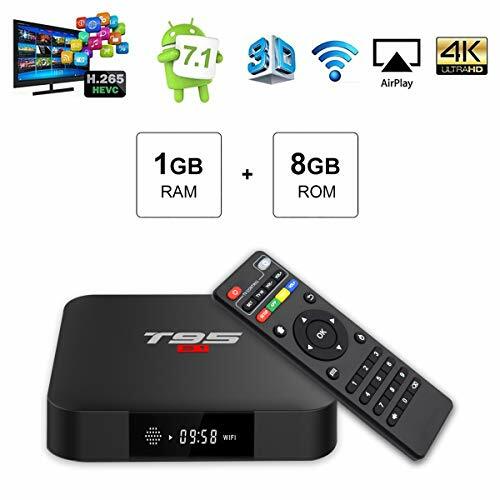 Support 4K: No need go to the cinema to watch 3D movie, T95 S1 android 7.1 tv box supports 4k and 3D no problem! Enjoy your leisure time with our 4K HD media player. Suitable Occasions: Birthday parties, weddings, carnival parties, holiday gifts, banquets, business meetings, dating, cosplay parties, family gatherings ect. Enjoy watching videos, playing games, surfing the Internet with android tv box. It is so easy to have a joyful and convenient life with mini smart tv box. Package Included: 1 x Android TV Box; 1 x US Power Adapter; 1 x Remote Control; 1 x HDMI Cable; 1 x User Manual. If you have any questions, please feel free to contact us. 【Newest Android 7.1.2 OS】The latest all-round upgraded Android operating system with better WiFi siginal than previous version, would give you fresh feeling, such as smooth and high performance in enjoying games or apps, watching videos or live streams, etc.The quality configuration provides you with ultra-fast running speed. It's more easier for you to operate it. 【Latest S905W Quad core Cortex A53 64Bits Chipset】Amlogic S905W quad-core CPU which can give you high-speed feedback and smooth response. Mali-450 as GPU of this TV Box which gives you the high definition pictures and videos. More than 2,000 applications are waiting for you, it could run many games, play unlimited movies, TV shows, music without freezing. 【High-Level Configuration】 2GB DDR RAM, higher running speed, without buffering or breaking down; 16GB ROM Flash, has enough room for installing apks, games etc. You can also expand the memory via the micro SD card slot (up to 128GB).You can download many favorite applications, never worry about running out of space. 【4K UHD & 3D experience】Coming with mighty decoding, it provides you much more smooth and fluid experience with 4K Ultra HD (2160p) resolution&H.265 supporting. And you can feel the shock of the 3D cinema-like stereoscopic vision at home. Whether you're watching in HD, 4K@ 60fps, or playing 3D games, you'll get clear, immersive picture quality that's optimized for your TV with crisp details and rich color. 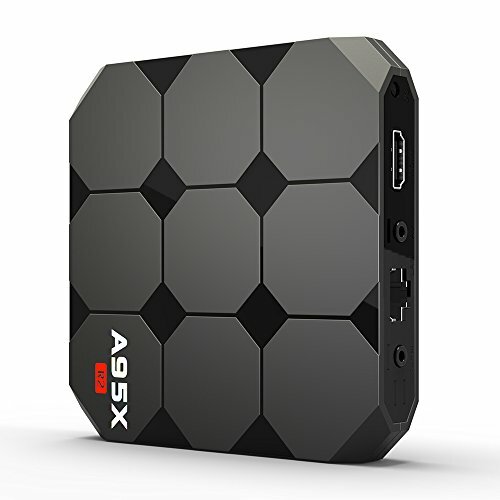 It Amlogic S905w Quad core ARM Cortex-A53 and 64 bits CPU makes your box running faster than other boxes on market. Comes with Google Android 7.1 Marshmallow OS, the newest generation of multimedia player, supporting 4K Ultimate HD video hardware decoding. Full web browsing, picture viewing, social networking, make phone calls with Skype, online video chat, play video games, and so on. Powerful HDMI cable 17+1 supports to play real 4K source (60HZ, 4320P) with fastest data transmission; Power cable with magnet ring is to suppress common-mode voltage, avoid Electromagnetic interference and protect against the circuit of the Android TV box and Power adapter itself. H.265 hardware decoding can save 50% bandwidth resources, Support files directly from USB drive, SDHC cards, or stream from the internet. 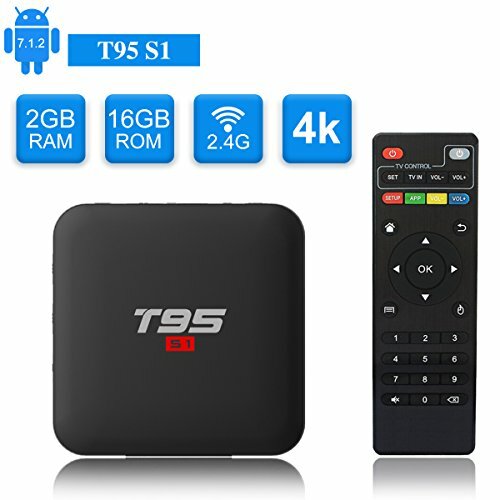 ✿High Profession and Smart: T95 S1 smart tv box uses professional Amlogic S905W Quad Core Cortex-A53, 1G RAM+8G ROM, comes with Android 7.1 operation system and wifi which make sure the android tv box running stable and smooth to load movies, pictures and games without buffer, no need to wait for wonderful moment. ✿Support 4K: No need go to the cinema to watch 3D movie, T95 S1 android 7.1 tv box supports 4k and 3D no problem! Enjoy your leisure time with our 4K HD media player. 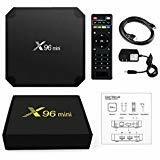 ✿Plug and Play: Install in less than 1 minute, all you need is to connect HD cord with your TV, then the Ethernet / WiFi, then you can turn on your Smart Android TV Box and TV to enjoy the splendid viewing world. ✿Suitable Occasions: Birthday parties, weddings, carnival parties, holiday gifts, banquets, business meetings, dating, cosplay parties, family gatherings ect. 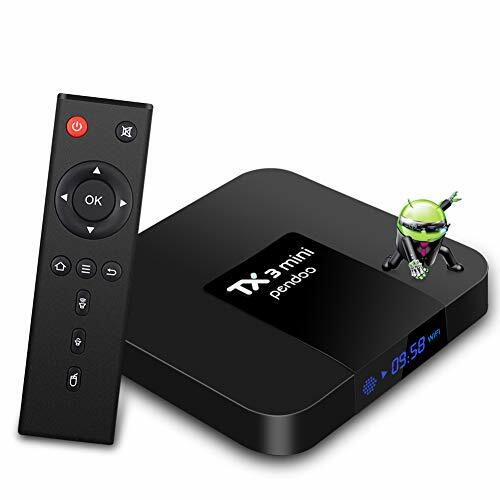 Enjoy watching videos, playing games, surfing the Internet with android tv box. It is so easy to have a joyful and convenient life with mini smart tv box. ✿Package Included: 1 x Android TV Box; 1 x US Power Adapter; 1 x Remote Control; 1 x HDMI Cable; 1 x User Manual. If you have any questions, please feel free to contact us. 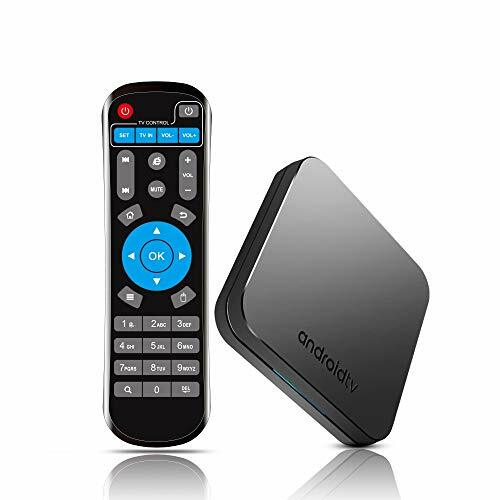 【LATEST ANDROID 7.1.2 OS TV BOX】 VANKYO TB80 Android TV Box running the latest Android 7.1.2 OS delivers an smoother and more responsive experience to load movies, pictures and games. 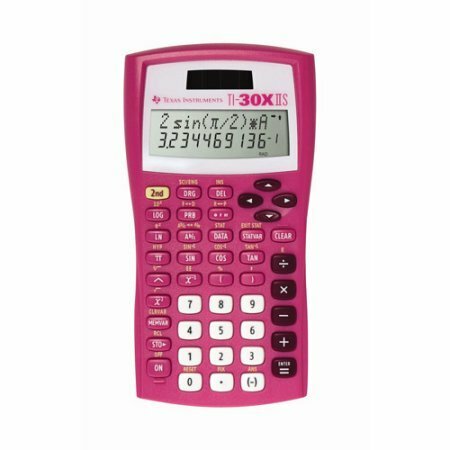 Super compatibility with various apps, meets all needs of different users. DIY your entertainment time with VANKYO Android TV Box. 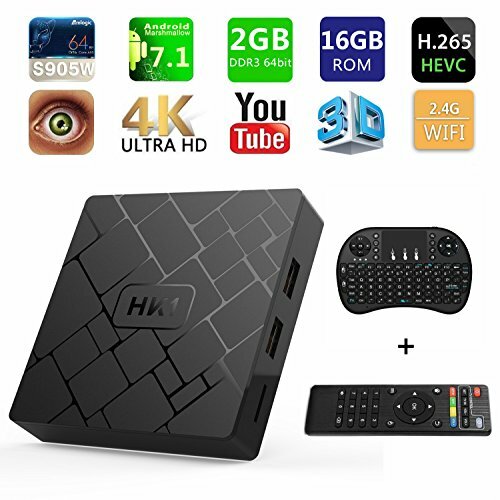 【4K HDR VISUAL ENJOYMENT】VANKYO Mini Android TV Box supporting 4K Ultra HD, HDR and H.265 Decoding Technology, experience true-to-life picture quality, catching your eyes. 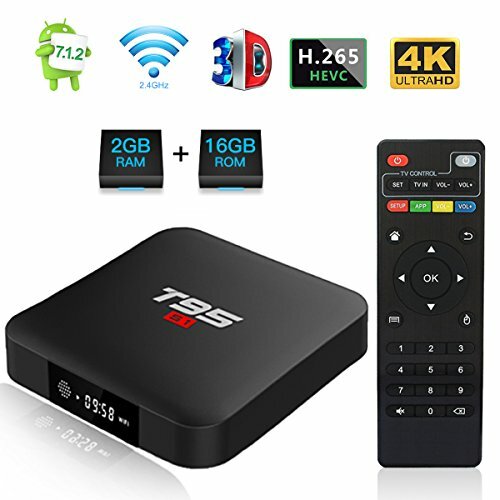 Supporting 2.4GHz WIFI and build-in 100M Ethernet Connection Port to directly link devices, makes home entertainment easier through a VANKYO TB80 Android TV Box. 【NEW ARTIFICIAL INTELIHENCE SYSTEM】VANKYO Smart TV Box Powered by the professional Amlogic S905X Quad Core Cortex A53 2.0GHz 64 Bits, with Penta-Core Mali-450MP GPU focusing on maximizing processing efficiency. Higher configuration provides ultra-fast running speed and professional image processing ability, no freezing and buffering any more. 【HIGHER CONFIGURATION】2GB DDR3 RAM, higher running speed without buffering or breaking down, 16GB EMMC FLASH ROM, enough room for installing apks, apps and games etc. Expand the storage via micro SD card slot (up to 128GB). Never worry about running out of space. 【BREATH-TAKING LOOKING】 Exclusive customized looking design adds more textured with the stylish geometric details, complete the home theater fashion. 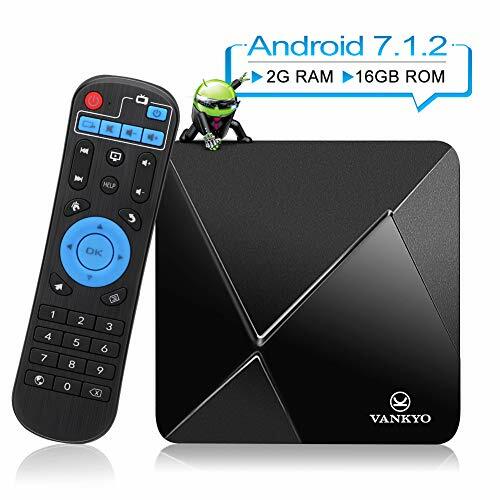 Package includes VANKYO Android 7.1.2 TV Box, Remote Control, Power Adapter, HDMI Cable, User Manual. [Android 7.1 OS] W95 runs on the latest Android 7.1 System which is perfect in productivity, stability and performance, along with various of features and optimizations, delivering an improved user experience. [Amlogic S905W CPU] Powered by Amlogic S905W Quad core ARM Cortex-A53 CPU up to 2.0GHz ultra high frequency, W95 is a HD media player with Mali-450 penta-core, up to 750MHz GPU. [Memory & Expandable Storage] It boasts 1GB RAM and 8GB ROM, supporting TF Card Reading up to 32GB, giving you more space to store your favorite media files and to browse websites, play games, watch movies more smoothly. 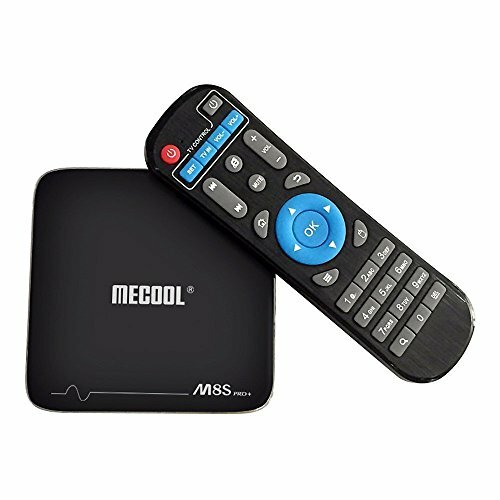 [Your Own Home Theater] Once connected W95 with your WiFi or RJ45, your HDTV becomes into a smart streaming machine. You can watch movies and TV shows and play games from the Internet, making home entertainment easier. ✔ The LASTEST ANDROID 7.1: The newest J-DEAL smart TV box used android 7.1 OS system which is more stable than other Android systems, compatible with the latest android applications and it's easier to install or uninstall, no buffering or hang time, which improves users' experience. 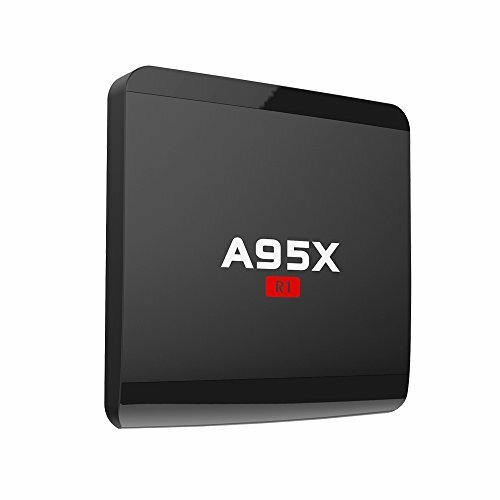 ✔ S905W QUAD CORE: The box comes with amlogic S905W quad core ARM cortex-A53 CPU is way ahead in image processing and computing. The high machine configuration with ultra-fast running speed and professional image processing ability is definitely makes you enjoy 4K movies. 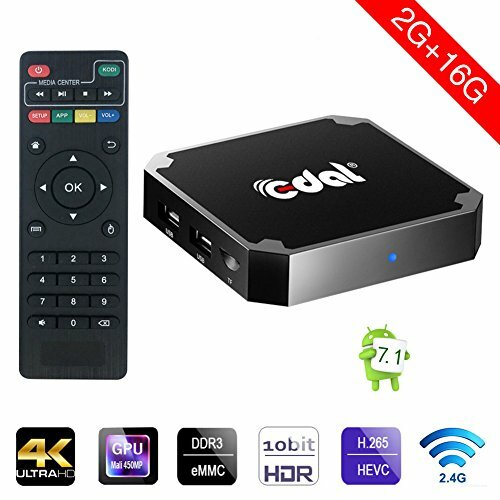 ✔ 1GB RAM & 8GB ROM: J-DEAL TV box is built with 1GB RAM and 8GB ROM Flash, with 8GB ROM you have more space to install your favorite APPs and videos, and 1GB RAM makes your APPs run fluently. ✔ MULTI-PURPOSE: This smart TV box is supported to play almost all the audio and video formats, bringing you to enjoy 4K ultimate HD video. Such as supporting social network, on-line movies. ✔ WARRANTY: We are glad to offer you an exchange or refund during our 1 year warranty if it is the product problems. And if you have any questions, please feel free to contact us. 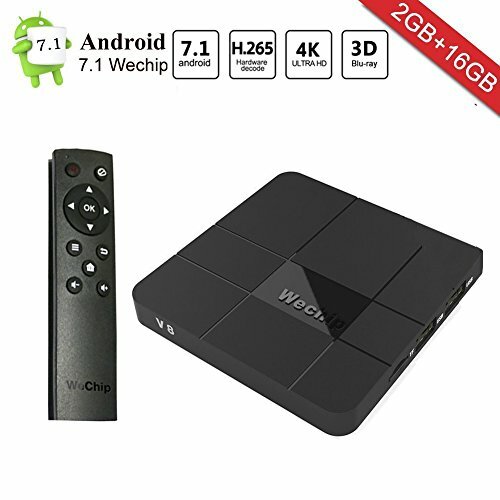 &#x1F525; 2018 NEWEST ANDROID 7.1,RAPID & STABLE SYSTEM -- Wechip TV box adopt the powerful and mature Android 7.1 operating system(Rapid & Stable System) -- Latest android experience TV box, smooth and high performance in enjoying games. &#x1F525; HIGH PROFESSIONAL AND SMART -- No need go to the cinema to watch 3D movie, v8 android 7.1 tv box version support 4k and 3D no problem! Enjoy your leisure time with our 4K HD android tv box. 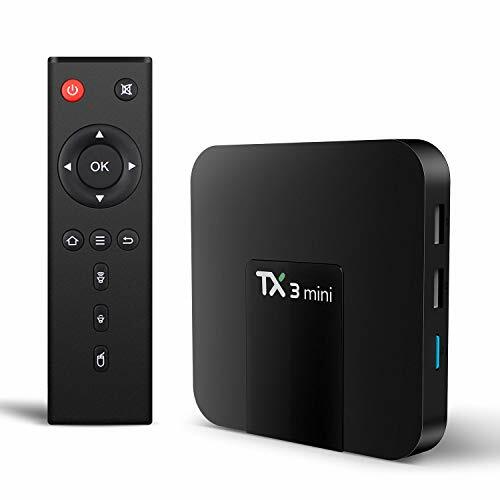 &#x1F525; PLUG AND PLAY --Install in less than 1 minute, all you need is to connect HD cord with your TV, then the Ethernet / WiFi, then you can turn on your smart android tv box and television to enjoy the splendid viewing world. &#x1F525; AWESOME CPU&GPU-AMLOGIC S905W -- 2.0G 2G RAM(DDR3) + 16GB ROM(EMMC).External Hard Drive USB connection supported. Smart Box TV with Built-in 2.4 GHz WiFi and LAN,HDMI port: Easy connection and simple operation. &#x1F525; WARRANTY -- Lifetime warranty. If you have any questions about the tv box android, please feel free to contact us, we will solve it for you until you're satisfied. [Powerful Hardware] - Amlogic S905W 64 bit Quad core ARM Cortex-A53 CPU up to 2 GHz Ultra high frequency, provides you with ultra-fast running speed and professional graphic processing ability. Supports 1GB DDR3 RAM 8GB eMMC ROM gives you more space to enjoy your entertainment. 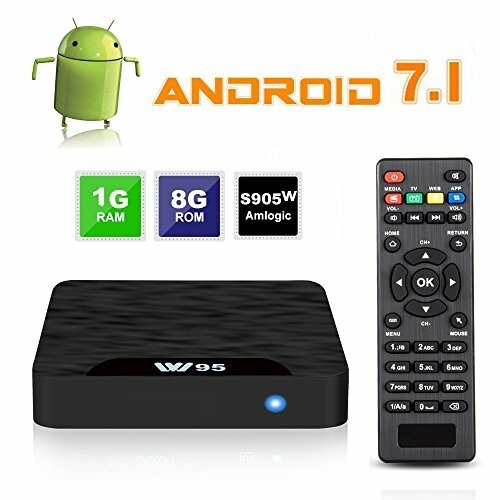 [Fun Unlimited] - Android 7.1 OS tv box. Users can download, install or uninstall hundreds of free software, games and application programs easily and conveniently. You can find many useful add-ons for your TV box. It is built for Family Fun & Entertainment. It Supports decoding and playing almost all popular audio and video formats. [High Quality] - Based on H.265 HD decoding, it offers 4k * 2k output with 100Mbps cable network which provides you high definition viewing and fluent video playing. [Supports WiFi & LAN] - H.265 hardware decoding can save 50% bandwidth resources, let you watch the 4K movie smoothly. 4K 1080i/P resolution is 4 times of full HD, so every detail of the screen is lucidity. 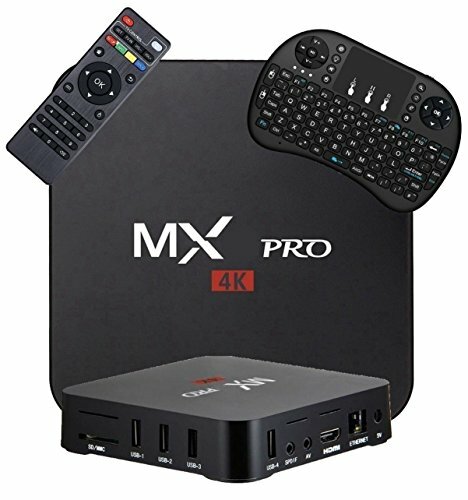 [Product Guarantee] - 100% Genuine Product Warranty for this X96 Mini TV Box. Don't get burned by buying from Cheap 'Just Launched' Chinese Knockoff Stores. Check Feedback. Powerful Processor: A95X R1 is equipped with Quad Core CPU which is advanced in image processing and computing. Its high machine configuration gives you ultra-fast running speed and smooth image processing performance. With the HDMI 2.0a data output, it makes sure you can enjoy 4Kx2K movies. Speed & Stable Operation System: A95X R1 adopts the fast and powerful Android 7.1.2 operation system. The Android 7.1 has a better compatibility of software, games and application programs. Rapid, stable configuration coupled with the highly Android 7.1. Say goodbye to the system freezing and buffering. Easy & Convenient to Use: A95X R1 supports Ethernet 10/100M, standard RJ-45 and Wi-Fi. It is very easy to install, as soon as you plug in the power supply and connect the box to your Wi-Fi, you watch whatever you like. Users can surf the internet with browsers and have a communication with the world through kinds of apps, like YouTube SKYPE video call, MSN, Facebook, also the hot films and TV shows can be searched at any time. 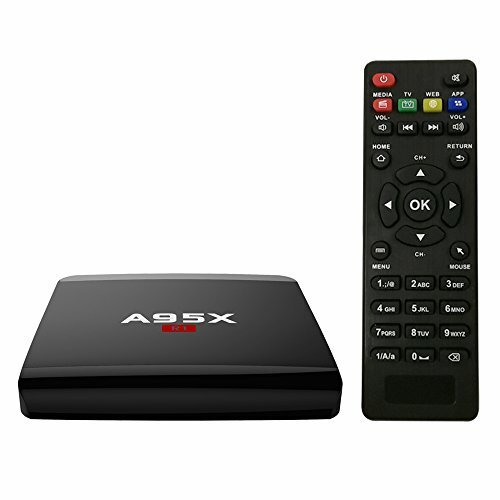 Practical Multi-media Player: A95X R1 is a practical home media player, feel free to enjoy all your favorite movies, sport shows and entertainment programs. And you can also save the games, movies and TV shows you like, just take advantage of the 8GB storage. 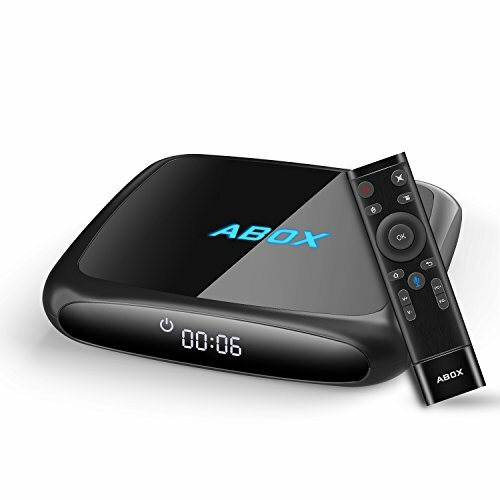 A95X R1 supports DLNA, Google TV Remote, LAN, 3D moive, Email, office suit, etc. Give You MoreHave a A95X R1 at hand, you will have a wonderful and enjoyable leisure time. On the other hand, A95X R1 is also a best choice for your family entertainment,you can have your family members play games or watch TV shows together. What's more, A95X R1 cab be a good gift for your kids and friends. The Leading Science and Technology--Smart Android TV box has Quad core ARM Cortex-A53 CPU, Mali-450 penta-core, up to 750MHz+(DVFS) GPU. Its high machine configuration gives you ultra-fast running speed and professional image processing ability.You can also have access to all the tools at the play store smoothly. 2G RAM 16G ROM :This smart tv box boasts DDR3 2GB RAM and 16GB eMMC Flash ROM,an extra 32GB memory can be added by TF card,run fast and stable operation, gives you space and freedom to install apps. Easy Connection & Operation--Android TV Box has HDMI and AV out port. 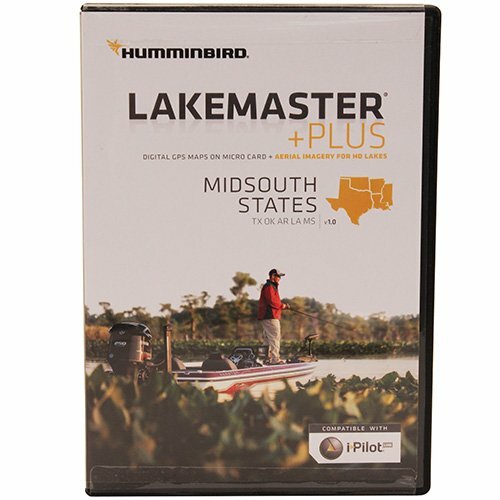 You simply plug the box into your device by HDMI for HD or RCA for standard definition.Two 2.0 USB ports, connect with your mouse and keyboard to help you operate more conveniently. UPGRADED ANDROID 7.1 :the NEWEST Generation of smart android tv box,which raises the bar in performance and usability with a slick lag-free interface, compatibility with the the vast majority of latest android applications such as youtube,MSN,YouTube and many games,to meet the needs of different users. 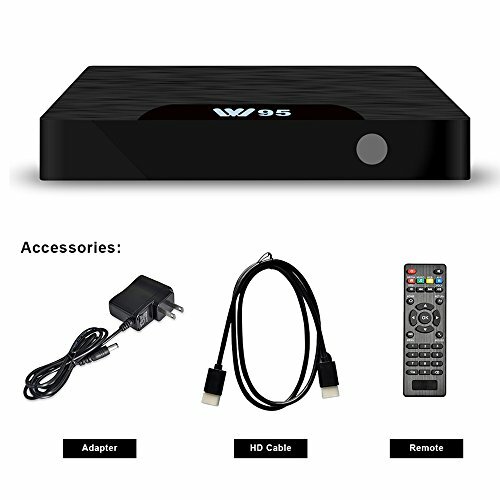 Google TV box--4K 1080 P resolution is 4 times of full HD, don't let you miss any details, with kodi pre-installed. It integrated the latest media player software, with full functions of the multimedia entertainment. 【Amlogic S905X CPU】With a powerful S905X quad-core 64bit cortex-A9 CPU,its performance is surely going to be smooth. 【Android 7.1 system】Upgrated Android 7.1 version, it is the latest and greatest operating system on the market and it support OTA air update. 【2G+16G】 Mecool M8S boasts DDR3 2GB RAM and 16GB eMMC Flash ROM,an extra 32GB memory can be added by TF card. 【Bluetooth 4.1&Dual band WiFi】The bluetooth is 4.1 version, which is easy to pair with most Bluetooth-enabled devices.It supports 2.4G/5G WiFi and 100M LAN which guarantee stable transmission efficiency and a strong transmission signal. 【4K HDR and 3D video】Surports 4K HDR/ 3D video and gives you a private 3D home theater.You can feel the shock of 3D cinema-like stereoscopic vision at home. 【The Latest Android 7.1 OS】The android 7.1 tv box adopts the fast and powerful Android 7.1 operation system,which makes sure the tv box is way ahead in professional image processing and ultra-fast running speed. 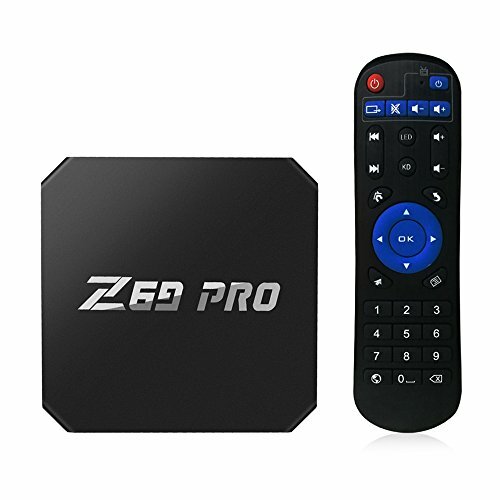 【High Reaction Speed】The android tv box is equipped with the newest chipset loaded with the high speed Quad Core CPU,up to 2 GHz ultra high frequency,more than 4 times performance improvements. Support 2.4GHz WIFI (not support 5.0GHz WiFi) and 100M. 【2GB DDR3/16GB EMMC Flash】The android box 2GB 16GB and extension up to 32GB supports enough space and freedom to download your favorite apps,browse websites,play games and watch movies more smoothly. 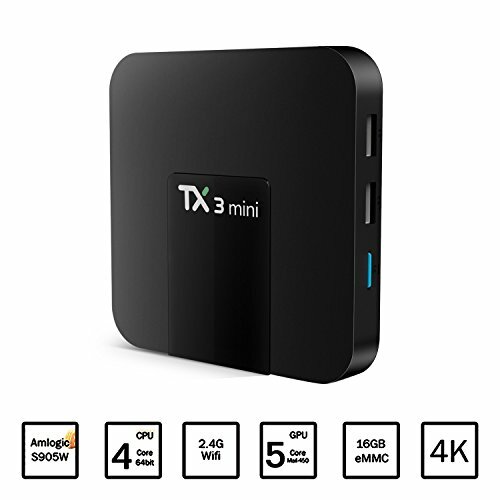 【4K And H.265 HD Decoding】TX3 Mini 4k tv box support 4K and H.265 HD decoding,offers 4k * 2k output with 100Mbps cable network which provides you higher definition viewing and fluent video playing. 【Pendoo Service】 TX3 Mini Android TV box is a smart tv box which provides better and happier entertainment experience for you to stay with your family and friends.All products from pendoo guarantee One Year Warranty and the best after-sales service. A Sweet Update to Nougat: GooBang Doo ABOX MAX TV box runs on the latest Android 7.1.2 OS which adds a handful of new features as well as optimization and bug fixes rather than being radically different from the Marshmallow 6.0 version. With GooBang Doo's sleekest user interface, you can quickly find and enjoy the entertainment you are in the mood for. New Generation Multimedia SoC: Powered by Amlogic Quad core A53 processor running at 2.0 GHz, it's fast enough to run video flawlessly. With a Mali 450MP3 GPU focusing on maximizing processing efficiency, it features high end video playback capabilities. Extreme Visual Feasts: The newest Amlogic processor supports 4K video decoding and HDR media profile. Whether you're streaming in HD 4K or HDR, you'll get clear immersive picture quality that's optimized for your TV with crisp details and rich color. All the details will be caught by your eyes. H.265 video decoding technology with WIFI 2.4GHZ offer a stable WIFI signal, and loads resources by taking half time and half occupation of bandwidth of H.264 decoding, it is more faster and stable. [Social Network] - Skype chatting,Picasa,Youtube,Flicker,Facebook,Online movies Google Chrome, Google+, Google play, facebook and etc..
[Android 7.1.2 OS] X96mini runs on the latest Android 7.1.2 System which is perfect in productivity, stability and performance, along with various of features and optimizations, delivering an improved user experience. [Amlogic S905W CPU] Powered by Amlogic S905W Quad core ARM Cortex-A53 CPU up to 2.0GHz ultra high frequency, X96mini is a HD media player with Mali-450MP penta-core, up to 750MHz GPU. [VP9 & UHD 4K] decoding occupies less bandwidth (about 50%) than H.264; VP9, powerful decoding capabilities, can decode most of the file formats at present. UHD 4K * 2K output provides you high definition viewing and fluent video playing. Wide application: It integrated the latest media player software, with full functions of the multimedia entertainment, supporting the vast majority of Android APP. Equipped with a remote to control the TV Box. It supports mouse and keyboard via USB, you can operate it more convenient.